The high-powered United States women's basketball team celebrated 20 years of dominance by becoming the first team to reach the semi-finals of the Olympic tournament by overwhelming Canada 91-48 on Tuesday. The lopsided victory over their North American neighbours extended the U.S. women's Olympic winning streak to 39 games and put them into the final four against either China or Australia, silver medallists at the last three Olympics. Diana Taurasi paced the unrelenting U.S. attack with 15 points as five Americans scored in double figures. "We had a ton of assists," guard Lindsay Whalen said about the U.S. total of 29 in the game. "That shows an unselfish team and unselfish players." Kim Smith scored 13 points as top scorer for Canada, who have not beaten the U.S. women since a world championship victory in 1975. The triumph came on the 20th anniversary of the start of the U.S. winning streak that brought them the bronze medal at the 1992 Barcelona Games and the next four Olympic titles. They are now within two more victories of the London crown. Canada coach Allison McNeill did not take long to respond when asked what was the difference in the game. "The difference would probably be 12 of the best players in the world against 12 players who are not the best players in the world," said McNeill. The Americans used an harassing defence to get easy points right from the start as they scored 19 of the first 23 points and would have produced an even more one-sided score line had they shot the ball better, missing many easy opportunities. "We were missing a lot of easy shots, open shots," said Seimone Augustus, before adding ominously, "we'll try to make up for that in the semi-finals game and be more offensively efficient." 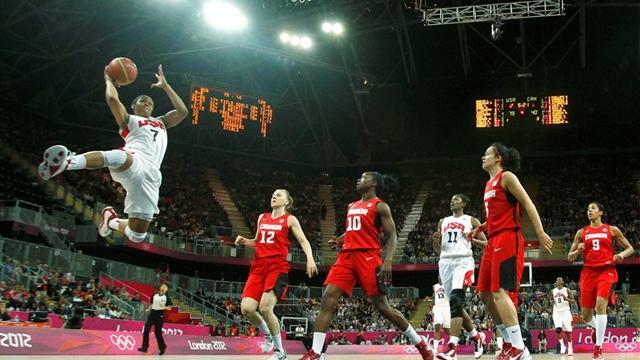 Canada were limited to a 30 percent rate of success in their shooting and were victimised by 15 steals by the Americans. Despite their farewell defeat, McNeill pronounced the Olympics showing a big success for the underdog Canada team that was 2-3 in the preliminary round with every game decided by a single-digit margin. I'm really happy with our effort," she said. "We're thrilled to have been in the quarter-finals and how we've played. We've been on an amazing ride from qualifying to here."